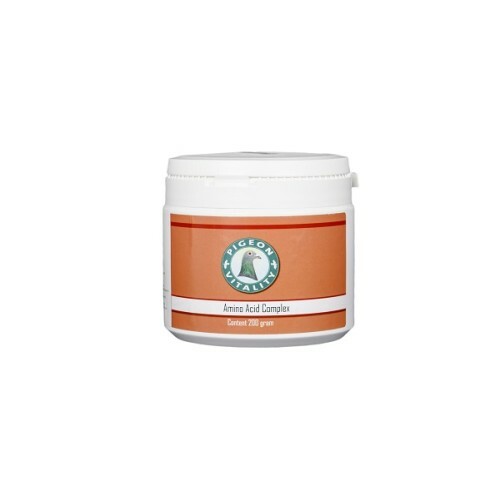 Amino Acid Complex 200gr by Pigeon Vitality is a great high quality and concentrated blends of all essential amino acids, and in particular enriched with the two amino acids lacking in most grains: Methionine and Lysine. All balanced in correct ratios for pigeons. Note that the pigeon cannot produce the essential amino acids itself, so these need to be part of the feed. Our amino acid complex contain the needed essential amino acids and is a superb product for breeding, moulting and in the evening after race. It secures fast absorption of needed amino acids which again are converted to the needed proteins by the pigeon itself. - After race add to the grain 1-2 days (moisture with Omega 3 oil). - In the breeding and moulting season add 2-3 days a week (moisture with Omega 3 oil). - Dosage: 1 spoon level (6 gram) per kilo grain.